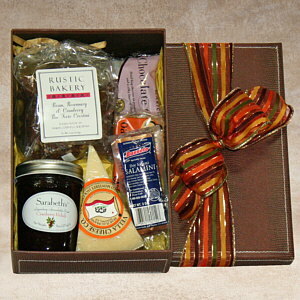 Artisan Products nestled in a brown faux leather box makes a simple yet elegant gift. A few of our favorites are included such as: Vella Aged Jack Cheese, Rustic Bakery Pecan,Rosemary and Cranberry Crostini,Sarabeth's Cranberry Relish (best jams ever), Busseto Salami, Elsie's Oat Cakes, and Marich Chocolalte Cherries (one of our all time top sellers). Presented closed with a beautiful bow on top, green gifting at its best.